Soon we’ll be seeing signs of autumn and your children may start wondering. Why do leaves change color in the fall? How do you make applesauce? Where are the geese flying? Snuggle up and read some children’s books together and satisfy your child’s curiosity. Read and learn about autumn, go for a walk looking for colorful leaves, taste some newly picked apples, and enjoy the glory of the season with your family. “The Busy Little Squirrel” by Nancy Tafuri. Just like the squirrels in your own neighborhood, this little squirrel scurries here and there as the summer changes to autumn and he prepares for the winter ahead. “Seed, Sprout, Pumpkin Pie” by Jill Esbaum. In this story illustrated with photographs, your child will see how a little pumpkin seed becomes a sprawling pumpkin vine and eventually can be baked into a golden pumpkin pie. “Fall Mixed Up” by Bob Raczka, illustrated by Chad Cameron. Words and pictures about autumn are silly jumbles of mistakes. Look for what is not quite right on each page. Do bears really gather nuts and do geese hibernate? “Leaf Jumpers” by Carole Gerber and Leslie Evans. Make a pile of leaves and jump! You’ll learn about why leaves change color and why they fall off trees. “Applesauce Season” by Eden Ross Lipson, illustrated by Mordicai Gerstein. Red apples, orange leaves, and bright blue sky–It’s time to make applesauce. You’ll want to make your own after reading how easy it is to do. Start your own fall family tradition! “Hello Harvest Moon” by Ralph Fletcher, illustrated by Kate Kiesler. The big full moon during harvest time is celebrated in words and beautiful illustrations. “The Roll-Away Pumpkin” by Junia Wonders, illustrated by Daniela Volpari. Maria goes on a chase after her pumpkin escapes her grasp one windy autumn day. “The Little Yellow Leaf” by Carin Berger. This little yellow leaf has to be brave because it’s going to be autumn soon and he knows he will fall from his tree. “Autumn Is Here!” by Heidi Pross Gray. See the changes that happen as autumn arrives. Children will enjoy the whimsical text and repeated refrain. Experience the colorful, bountiful season of autumn in new ways with ideas from children’s books. Read a book to your young child and then extend the book experience with crafts, cooking, counting, and learning. “Leaf Man” by Lois Ehlert. With just a few leaves of different shapes and colors, “leaf man” is created and off on an adventure, sailing through the autumn sky. After reading this book you’ll be inspired to make your own leaf people and animals. Go on a walk and collect leaves, nuts, and other fall treasures to arrange into a story you and your child can make up together. There are also facts in the back of the book so you can learn the names of the trees in your neighborhood. “Johnny Appleseed” by Steven Kellogg. Enjoy a crunchy red apple as you read the story of the American frontier hero, Jon Chapman, know best as Johnny Appleseed. The text is a bit long, but younger children can see the story unfold in the dynamic illustrations. Facts about the early 1800’s are woven together with some tall tales about Johnny Appleseed’s adventures to make an entertaining story. “Pumpkin Soup” by Helen Cooper. A cat, a squirrel, and a duck work together to make pumpkin soup the same way, every day, until… Duck decides to do it a different way. Oh no! The three friends have to figure out how to still be friendly to each other. There’s a pumpkin soup recipe included if you want to try cooking up some of your own. “Apples and Pumpkins” by Anne Rockwell, illustrated by Lizzie Rockwell. Apple picking, pumpkin carving, and marveling at red and yellow leaves are all part of autumn fun. Bold, colorful illustrations and simple text introduce young children to the wonders of the season. The book ends with jack-o-lanterns shining and trick-or-treating. 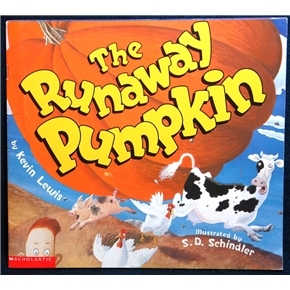 “The Runaway Pumpkin” by Kevin Lewis, illustrated by S.D. Schindler. This is a rollicking, frolicking rhyming journey of the Baxter family trying to catch up with a runaway pumpkin. Preschoolers will giggle at the antics of the chase and silly sounding words in this story. “Why Do Leaves Change Color?” By Betsy Maestro and Loretta Krupinski. Learn why autumn leaves are so colorful and discover lots of activities you can do with the leaves in your own backyard. This is a “Let’s Read and Find Out Science” book for young children. “How Many Seeds in a Pumpkin?” by Margaret McNamara, illustrated by G. Brian Karas. This is a story of children in a classroom, but also an estimating game using math and science knowledge. Pumpkins seeds are slimy when they come out of a pumpkin, and there are so many to count. Which has more seeds–a small pumpkin or a big one? Have a Fruit-full Autumn Reading Together! We’re in the peak of fruit season in the Finger Lakes in New York State. We’ve seen cherries on trees earlier this summer; peaches and plums have ripened recently; and now that it’s officially autumn, apples and pears are ready for the picking–and eating. How many fruits have you introduced to your young child? Read about them in picture books and then try them out. See which fruit your child likes or doesn’t like. Explore the tastes, the textures, and smells. Compare the colors and the shapes. Are there some unusual fruits you’ve seen in books that you can find at the store? Be adventurous and taste something new! “Eating the Alphabet” by Lois Ehlert. Learn the names of vegetables and fruits from A to Z in this colorful book, then see if you can make your own list of foods for each letter of the alphabet. 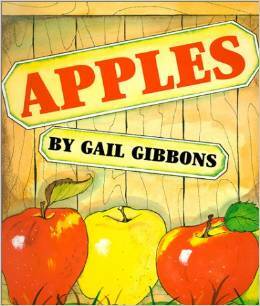 “Apples” by Gal Gibbons. You will discover how an apple is formed from flower bud to fruit in this non-fiction book. The text introduces new words about pollination at a level that young children will understand. “The Biggest Apple Ever” by Stephen Kroll. Here’s a story about friendship, competition, conflict resolution, and apples, too. This book lends itself to many related projects involving teamwork–with a side of apple pie. “Play with Your Food” by Joost Elffers. Photographs of fruits and vegetables that are slightly altered to give them humorous and witty personalities may give you some ideas for how to creatively play with the food in your own kitchen. “Blueberries for Sal” by Robert McClosky. Little Sal and her mother go blueberry picking on one side of a hill while a mother bear and her bear cub look for blueberries on the other side of the hill. Find out what happens when their paths cross. “The Very Hungry Caterpillar” by Eric Carle. “… and he was still hungry” is the refrain as this growing caterpillar eats his way through a smorgasbord of fruits and other delicious food until he is a big, plump caterpillar ready to become a butterfly. Fall Leaves, Pumpkins, and More! 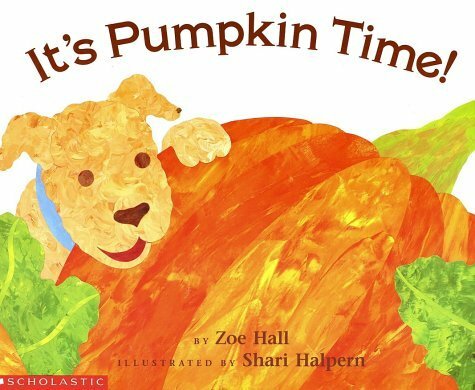 “It’s Pumpkin Time” by Zoe Hall, illustrated by Shari Halpern. The illustrations are in Eric Carle-style collage made with beautiful hand-colored paper. The story tells about how a pumpkin grows from a small seed to big orange globe that can become a jack-o-lantern. 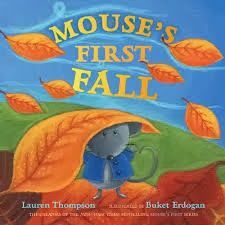 “Mouse’s First Fall” by Lauren Thompson and Buket Ergodan is a board book for babies and toddlers. Simple descriptions of autumn and charming illustrations give young children words for the colors and shapes they and how much fun it is jump in a pile of leaves. This is just one in the series of “Mouse’s First” board books. “Fletcher and the Falling Leaves” by Julia Rawlinson, pictures by Tiphanie Beeke. Fletcher is a young fox. He is alarmed when he sees a leaf fall off a tree in autumn. Then more leaves float to the ground. He wants to put them all back! But, he is finally convinced that it is ok for the leaves to fall off the trees when he sees how other animals use them for nests and to keep warm. When the first frost comes, the bare branches of the tree look magically glittery and Fletcher appreciates how a tree is beautiful in every season. ”The Biggest Apple Ever” by Stephen Kroll. Mouse characters Clayton and Desmond join a contest to find the biggest apple ever. Will they compete with each other, work together, or come up with another way to enjoy the contest? For school-aged children, the theme of this story is friendship. “Red Leaf, Yellow Leaf” by Lois Ehlert. Colorful fall leaves are just one part of the life-cycle of a tree. Ehlert starts with the planting of a small maple sapling and then shows how it grows to maturity, using language that a young child will understand. A glossary in the back gives more details such as how a tree absorbs nutrients and uses photosynthesis. Illustrations are collage with cut paper, real seeds, fabric, wire, and plant material.